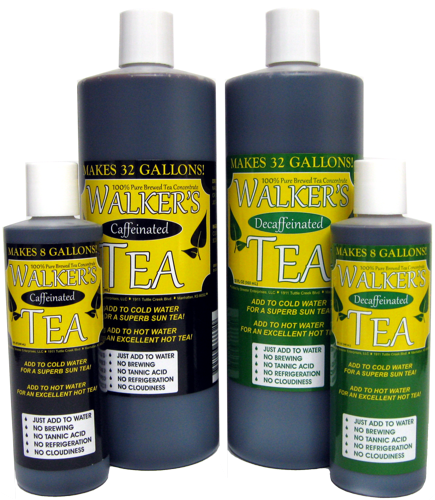 Walker's Tea Concentrate- Liquid Brewed Tea Concentrate, Caffeinated & Decaffeinated available. Walker's Tea concentrate is a 100% pure brewed tea concentrate. 1 oz. of the caffeinated or decaffeinated concentrate makes 1 gallon of a great sun tea or a wonderful hot tea! Add more or less to taste. Just add water and enjoy! Don't have time to make it the grocery store or just don't know where to buy Walker's Tea? Submit your order online today and get your tea shipped directly to you. Receive FOUR 32oz. bottles of your favorite tea concentrate, caffeinated or decaffeinated, sent directly to your door for only $69.99. And that includes the shipping!! Find Walker's Tea Concentrate at these great locations! Look for Walker's Tea Concentrate at these fine retailers! Walkers Tea is available in Caffeinated and Decaffeinated concentrates and in 32oz. or 8oz. bottles. Buy a WEB SPECIAL and SAVE with FREE SHIPPING! Copyright © 2011-2017 Walker's Tea. All Rights Reserved.